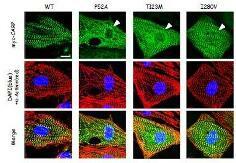 "Cardiac ankyrin repeat protein gene(ANKRD1) mutations in hypertrophic cardiomyopathy." Arimura T, Bos MJ, Sato A,Kudo T, Okamoto H, NIshi H, Harada H, Koga Y, Moulik M, Doi YL,Towbin JA, Ackerman MJ, Kimura A. "ANKRD-the gene encoding cardiac ankyrin repeat protein-is a novel dilated cardiomyopathy gene." Moulik M, Vatta M, Witt SH, Alora AM, Murphy RT, McKenna WJ, Briek A, Oka K, Labeit S, Bowles NE, Arimura T, Kimura A, Towbin JA.